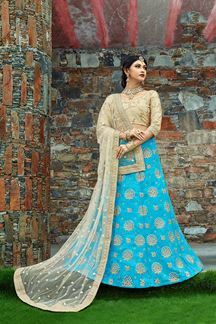 Dress in style with this distinct beige and blue designer lehenga choli set featuring red resham and gold zari motifs spread across the expanse of skirt while the choli bears zari embroidery for a fascinating glow! This lehenga choli set is accompanied by beige net dupatta with motifs and border.Length of choli comes of 13inches with work ! Note: Color may slightly vary due to digital photography.